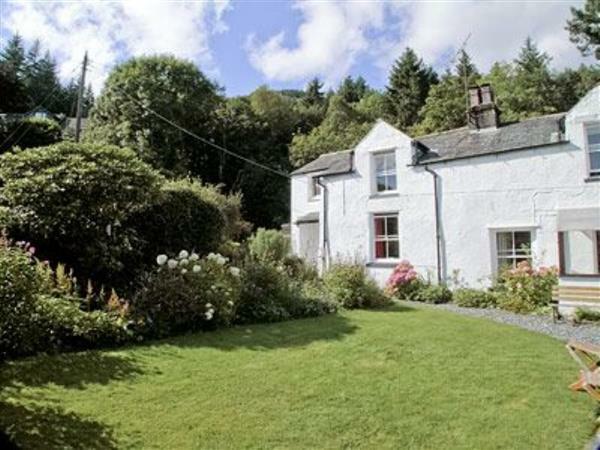 Beckside in Thornthwaite, near Keswick sleeps 3 people. A traditional Lakeland cottage adjoining the main property, approached through private grounds - a haven for red squirrels, it enjoys panoramic views of Helvellyn and the Causey Pike range. Situated on the edge of Coombe Beck and set against the spectacular backdrop of Skiddaw, a tranquil, unspoilt location. Forestry walks from the bridge across the beck, sailing, fishing, and Osprey viewing on Bassenthwaite lake. A perfect holiday retreat. Shops, restaurants and Theatre by the lake, 2 miles. Shop and pub 1¼ miles. Ground floor: Living/dining room. 2 steps down to kitchen. Garden room. Bathroom with shower over bath and toilet. First floor: 2 bedrooms: 1 double, 1 single. Woodburner in living room (intial fuel included). First amount partial Night Storage Heating, electric convector heaters and electric included, remainder by meter reading. Bed linen included. DVD. Electric cooker. Microwave. Garden with sitting area and furniture. Ample parking. No smoking please. No children under 12 years due to unfenced stream and ravine in the garden. Holidays at Beckside run from Saturday to Saturday. For a better idea of where Beckside is, you can see Beckside on the map below. Beckside is in Cumbria; should you be on the lookout for a special offer, you can find all the special offers in Cumbria. It's always worth checking to see what is on offer at the moment. Do you want to holiday near Beckside (18258), you can see other cottages within 25 miles of Beckside; have a look to find your perfect holiday location.